Be creative with your online fundraising in support of ovarian cancer awareness and research. Create a virtual event, attend an existing event or create a memorial page in honor of a loved one. These fundraisers are NOT connected to T.E.A.L.® events including T.E.A.L.® Walk/Runs. Spread the Word and encourage others to participate. 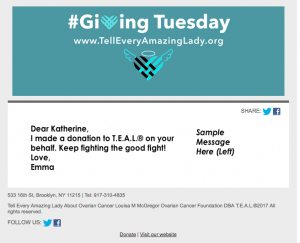 Organize your own fundraiser that supports T.E.A.L. 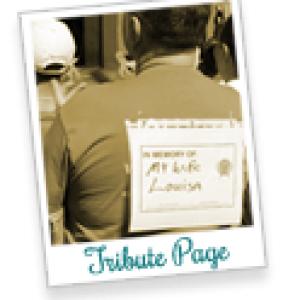 A tribute page can be a meaningful way to honor a loved one while making a difference by contributing to Ovarian Cancer awareness and research programs.